It’s Time for Medieval Monday! It’s time for another Medieval Monday blog hop! Our theme is, “Hero and heroine first encounter”. Each author has selected an excerpt from one of their books to share with you over the next few months. I’m excited to share the first excerpt from book, To Support A King. At the end of the post, you will see where to go on the following Monday to find out what happens next. A cold breeze encircled Catriona and chill bumps rose on her skin. Rubbing her arms, she noticed the darkening sky. Gray billowing clouds heralded dusk. She’d lost track of time. Danger lurked in the remote wilds of Scotland, and she had a long walk back to the shelter of the castle. She folded the missive, tucked it into her pouch at her waist, and then slid from the boulder. 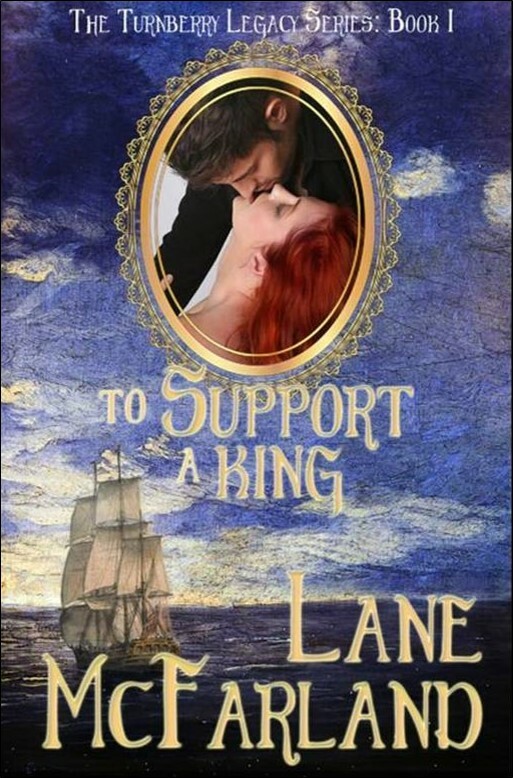 Follow along next week on Bambi Lynn’s blog at http://www.bambilynn.net/, , and leave a comment for a chance to win an ebook of To Support A King. Medieval Monday with Cathy MacRae! I’m excited to share the 13th excerpt which is from Cathy & DD MacRae’s book, The Highlander’s Crusader Bride. At the end of the post, you will see where to go on the following Monday to find out what happens next. A noise akin to thunder rumbled through the heavy door as fists pounded the boards, demanding entrance. Join me next week on my blog https://www.cathymacraeauthor.com/ for the next excerpt from The Highlander’s Crusader Bride! Medieval Monday with Barbara Bettis! I’m excited to share the 12th excerpt which is from Barbara Bettis‘ book, The Lady of the Forest. (Fire was chancy.) No other method for distraction presented such an opportunity, however. Fire would claim the attention of every person at Stonehill, including the villagers. Even the guards would rally to fight the flames. Leaving all prisoners unattended. The recent rains might have dampened the wood, but perhaps most remained dry enough to burn, at least enough to seem a threat. She counted on it. Plenty of smoke to attract attention but slow-moving flames that could be extinguished before they spread to the castle or to the whole forest. She’d start the fire herself and not endanger anyone else. Once the blaze caught, she’d slip through the gate to free Oscar and Henry. A tiny sigh escaped as she pressed her forehead against the door frame. The whole plan reeked of hastiness. Yet time and circumstance demanded quick action. She had no choice. Follow along next week at https://www.ashleyyorkauthor.com/blog. Be sure to leave a comment for a chance at an ebook of your choice. Medieval Monday with Ashley York! I’m excited to share the eleventh excerpt which is from Ashley York‘s book, Eyes of the Seer. Watching as Marcán’s eyes traveled the length of the new slave, assessing her, had made Astrid feel like she was being doused with cold water. The man was considering taking the slave to his bed! He wanted her. She was a pretty thing, obviously intrigued by Marcán—what woman wouldn’t be?—and as far as Astrid could tell, she’d given every indication she was more than willing. A sick feeling had unfurled inside Astrid. Certainly Marcán had taken plenty of women to his bed, or mayhap he went to theirs as Diarmuid had. Astrid was not ignorant, but she had never actually thought of Marcán in that way—until now. She struggled to contain the emotions that threatened to overwhelm her. Follow along next week on Barbara Bettis’ blog http://barbarabettis.blogspot.com/. Medieval Monday with Jenna Jaxon! I’m excited to share the tenth excerpt which is from Jenna Jaxon‘s book, Betrayal. The long pause raised his hopes to a pinnacle he knew to be false. Her flicker of jealousy toward Ysabel would not have erased her loyalty to Geoffrey so soon. So when her “aye” came, soft but sure, he had already begun to contrive their performance. “Remove the gown?” The alarm in her voice made him envision her clutching the garment to her. The worst betrayals come from within. After a night of passion with her betrothed, Sir Geoffrey Longford, Lady Alyse de Courcy is eagerly looking forward to her wedding. But when Geoffrey is forced to marry another, a heartbroken and possibly pregnant Alyse finds herself in her own private hell. She must either gamble with her reputation or marry someone she does not love. A reputed connoisseur of women, Thomas, Lord Braeton, has dallied with many ladies of King Edward’s court, although he has favored none. However, as Geoffrey’s best friend, Thomas has sworn to serve and protect Alyse, an oath now sorely tested when he agrees to marry her—in name only—to guard her reputation. Yet, as they grow closer, and Thomas discovers Alyse’s sweet but spirited nature, he comes to desire a marriage in truth. Can he overcome her memory of Geoffrey, or is Thomas doomed to burn with passion for a woman he can never possess? Follow along next week at www.jennifletcher.com to find out what happens next! Medieval Monday with Laurel O’Donnell! I’m excited to share the ninth excerpt which is from Laurel O’Donnell‘s book, A Knight With Grace. She lifted her large eyes to him. They reflected the moon in their depths. And William knew he was in trouble. How could he resist her? Such beauty. Such innocence. But he had to. She did not want to marry him. And he had given his word to help her escape the betrothal. She was right. No woman in her right mind would want to be wife to him. Lady Grace Willoughby defies her father’s orders to marry Sir William de Tracy and escapes with a friend. She has no intention of wedding a cursed man, a man ostracized from the church, a man who would only doom any future children they might have to the fires of Hell. She prays for a knight to rescue her. Excommunicated and outcast for a horrible crime in his past, Sir William de Tracy searches for forgiveness. Marriage has never crossed his mind until Lord Willoughby commissions him to retrieve his fleeing daughter and honor the dying wish of his father by marrying Grace. But things are not as they seem. And when an assassin tries to kill Grace, William must choose between his soul and the woman he has come to love. Can William and Grace overcome their past and find the redemption and love both are so desperately seeking? Medieval Monday with Jenni Fletcher! I’m excited to share the seventh excerpt which is from Jenni Fletcher’s book, Besieged and Betrothed. Ruthless warrior Lothar the Frank has laid siege to Castle Haword, but there’s a fiery redhead in his way—and she’s not backing down! More tomboy than trembling maiden, Lady Juliana Danville would rather die than lose the castle. When she’s caught on opposite sides of a war, a marriage bargain is brokered to bring peace. But is blissful married life possible when Juliana has a dangerous secret hidden within the castle walls? I’m excited to share the sixth excerpt which is from Elisabeth Hobbes‘ book, Redeeming the Rogue Knight. Understanding flashed through Roger, followed by revulsion. Lucy was not doing this through love, or even desire. It was a cold-hearted transaction. Roger wasn’t sure if this was worse or better than believing her in love. Find next week’s installment on Ashley York’s blog. Medieval Monday with Sherry Ewing! I’m excited to share the fifth excerpt which is from Sherry Ewing’s book, Only For You: The Knights of Berwyck, A Quest Through Time Novel (Book 2). Her feet virtually flew down the stone steps at the far end of the hall. She was a vision of loveliness with her long black hair flowing behind her in a cascade of long loose curls. She took one look at him when she reached the last stair and gave a happy cry of relief. Her pale blue dress all but floated behind her as she ran to him with tears streaming down her face. ***Since this is an author’s choice theme for Medieval Monday, leave comments for Sherry on each of her blog posts to be in the running for one of her eBooks. She’ll choose a random winner from the comments left and you’ll be able to get an autograph from her through Authorgraph! Katherine de Deveraux has it all or so she believes when she begins her life with her husband Riorden. But as she starts to settle into her duties as the Countess of Warkworth Castle, she finds that an easy life is not only difficult but downright dangerous to her well-being. Consumed with the haunting memories of his father, Riorden must deal with his sire’s widow who just happens to also be his ex-lover. Yet how could he know just how far Marguerite is willing to go in order to have the life she feels they were truly meant to live? Torn apart by circumstances neither Katherine nor Riorden could ever imagine, Time becomes their true enemy even while Marguerite continues her ploy to keep Riorden at her side. With all hope lost, will Katherine and Riorden find a way to save their marriage and have their happily ever after ending, or will Katherine be whisked back to where Time truly feels she belongs?